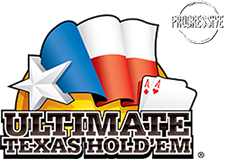 Ultimate Texas Hold'emSM Progressive features heads-up play against the dealer, a Trips bonus bet, and an exciting progressive bet. To play, players make equal bets in the Ante and Blind circles and may also make the Trips bonus bet and the progressive bet. Once players receive their two hole cards, they can either check or bet three to four times their Ante. The dealer then reveals the three-card flop. If players haven't already made a Play bet, they can check or bet two times their Ante. The dealer then reveals the turn and the river, and if players have not already bet, they can bet one times their Ante or fold. The dealer will then reveal his or her two hole cards and announce the hand. If the player's hand beats the dealer's hand, his or her Play and Ante bets win even money. If the dealer's hand beats the player's hand, his or her Play, Ante, and Blind wagers lose. If the player and the dealer tie, these bets push. The Blind pays if the player's winning hand is at least a Straight. If the player beats the dealer with less than a Straight, his or her Blind bet pushes. The dealer needs at least a pair to qualify. When the dealer doesn't qualify, he or she returns each player's Ante bet. All other bets receive action. The progressive bet wins if a player's final five-card hand contains a Full House or better. The top award – 100 percent of the progressive jackpot – pays when a player has a Royal Flush in the first five cards. To maximize game play, we recommend using an i-Deal single deck specialty shuffler. For more information on this game's paytable or odds, please contact your Bally Account Executive.